The five defendants facing serious criminal charges for the 2016 death of a young boy on the Verruckt water slide in Kansas City, Kan., are asking for separate trials. In a filing Tuesday in Wyandotte County District Court, Jeff Henry, John Schooley and Henry & Sons Construction, the general contractor, argue they cannot be tried alongside Tyler Miles and Schlitterbahn Waterpark of Kansas City, Kan.
Henry, co-owner of Schlitterbahn; Schooley, the lead designer of Verruckt; and Henry & Sons, a contractor run by the Henry family, all face charges of second-degree murder, aggravated battery and aggravated child endangerment. They were indicted by a Kansas grand jury in March, stemming from the 2016 death of a 10-year-old boy on the 17-story Verruckt water slide. Attorneys for Miles, who is accused of involuntary manslaughter, also filed a motion Tuesday that made substantially similar arguments. Miles is also accused of interfering with law enforcement. An indictment claims he tried to cover up evidence of previous injuries on the ride. All the defendants have pleaded not guilty and deny criminal wrongdoing in the Aug. 7, 2016, death of Caleb Schwab. Caleb was killed on the ride when his raft went airborne and struck a metal pole above the slide that supported a netting system. Tuesday's filing asks for a continuance of the scheduled Sept. 10 trial date for each defendant by arguing that the Kansas attorney general has so far refused to turn over to defense attorneys any transcripts of the Wyandotte County grand jury proceedings and lacks written reports by experts who testified before the grand jury. Defendants also argue that the nature of charges requires separate trials. Signs have emerged that each of the defendants will adopt different strategies to fight the charges. Schooley, a well-known designer of water park rides, has said in court records that he helped design Verruckt but that the design was altered after his involvement in the record-breaking attraction ended. In Tuesday's filings, Schooley, Henry and Henry & Sons Construction are referred to as the "design defendants," which is to say they have been accused of second-degree murder on the allegedly reckless way they designed the slide. 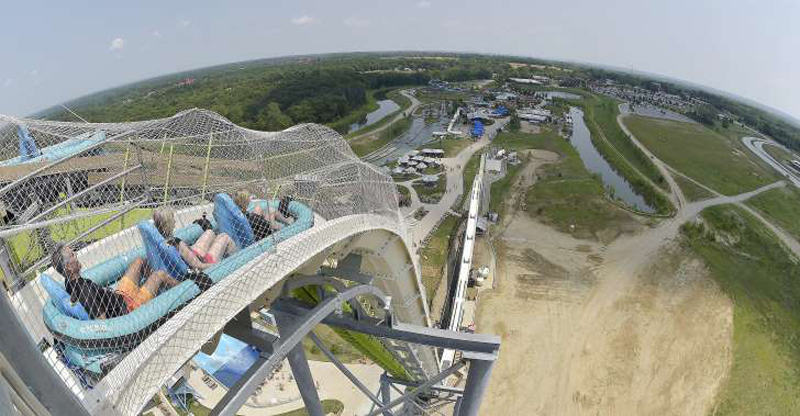 Miles and Schlitterbahn Waterpark of Kansas City, Kan., are referred to as the "operations defendants," those involved in alleged operational failures of the water slide. "Fundamentally, separate trials will be needed for the Design case distinct from the Operations case," Tuesday's filing said. Defense attorneys are also questioning the way the Kansas attorney general handled the grand jury investigation. They point out that the attorney general's office used quotes from Henry that came from a scripted television show on the Travel Channel. "Also, allegations made in the indictments which are central to the State's theory of prosecution are refuted outright by information provided by the State to defendants in the discovery," the filing said. Schooley is represented by Kansas City attorney J. Justin Johnston. Henry's lawyer is Carl Cornwell, and Henry & Sons is represented by Jeff Morris, both Kansas City attorneys. Miles is defended by Tom Bath and Tricia Bath. A status conference hearing is scheduled for Wednesday afternoon in Wyandotte County District Court before Judge Robert Burns.